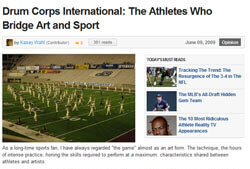 Drum Corps International's unique combination of artistic and physical prowess has caught the attention of sports fans: "Bleacher Report," an online sports network comprised of fan-generated content, recently mentioned DCI and urged readers to give the performers a second look. The article illuminates the similarities between athletics and drum corps, such as the importance of team work, the physical demands on performers, and the hours of practice and training required. Read the article at BleacherReport.com.